Pepper Paneer is a tasty starter or a dry preparation generally served with rice. It is a tasty combo especially at this cold season. I have used here to make the same recipe with Tofu which is so healthy when compare to cottage cheese. It is rich in protein and has lots of health benefits. This dish could be used as a starter or side dish for rice. Perfectly suits with rasam and rice combo. Perfect for this winter season. Try this dish healthy dish at your home and stay healthy. If you do not get tofu at the place you stay then replace it with paneer. Rinse the tofu in water and cut them into small cubes. In a pan heat the oil and add the onions and pinch of salt and cook till soft. Now add the crushed ginger garlic and curry leaves cook till the raw smell leaves. Now add the tofu cubes and salt stir in a medium flame to the water content to evaporate from the tofu and allow the tofu to cook for about 2 minutes. Now add the turmeric powder, pepper powder and garam masala powder and mix well and roast well for a minute or two till the mixture combine well and the masala coats well with tofu. Serve with Onion rings and lemon wedges as a starter or a side dish for rice with rasam. Notes: You could add a pinch of roasted jeera powder too if you wish. 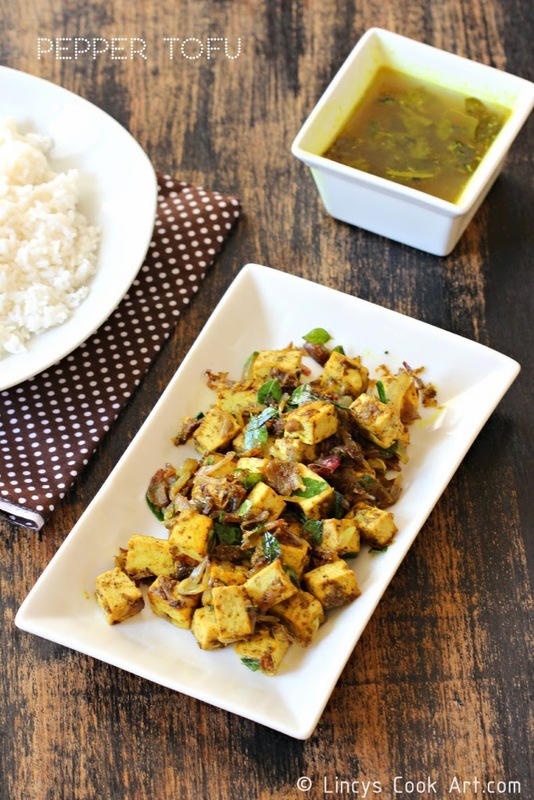 Replace tofu with paneer for variation.